Both being colors extensively found in nature, when used together, blue and green balance and complement each other to make adorable interiors. Generally, these daring, vibrant colors work well in any space, from bathrooms to living rooms and help make interiors with an unmatchable look. With so many tones, shades, and tints to choose from, blue and green form an array of truly stunning settings. Whether blue and lime green, indigo and citron, turquoise and lime, blue and Kelly green, teal and green, when used tastefully and creatively, in equal or different proportions, blue and green work well in spaces of diverse styles, from traditional to eclectic and ultra-modern ones. When it comes to blue and green, note that in all their variations, they make analogous color combos/any three hues neighboring one another on the color wheel/, such as blue-green, green, and yellow-green. Although analogous color combos might lend a slightly monochrome look, the interiors they create are harmonious and exciting. The above-mentioned color trio helps make spaces that are balanced, charming, and refreshing. A favorite way of using blue and green together is to enliven and add personality to predominantly white interiors. Blue and green definitely make a fabulous duo. However, to lend an organic look and create a sense of warmth and coziness, consider using the combo with other nature-related hues, such as yellow and brown. Painting is an easy, affordable way to add color to any space. Usually, some coats of paint work miracles and can update a room with pleasing results or completely transform and lend it a fresh, new look. Whether walls, bathroom or kitchen cabinetry, kitchen islands, dining chairs, doors, or even window frames, painting is a favorite, budget-friendly choice, which always works well. In the picture above, a gorgeous dining room. Green walls complemented by lots of greenery bring freshness to the space. The elegant dining chairs are with navy blue upholstery. An eye-grabbing chandelier makes a focal point and adds touches of luxury and sophistication. A piece of wall art and a pair of matching table lamps offer extra visual interest. Floor-to-ceiling navy-blue trimmed drapes complete the look of the space. Above shown is a contemporary bedroom of minimal design with a stunning ceiling and adequate natural light. Bold yet so elegant and adorable! A cozy daybed complemented by a floor lamp and a unique side table makes an inviting reading nook. An extra high tripod table topped with a trio of matching orbs adds tons of personality and visual interest. Above, pops of apple green freshen the space. An L-shaped blue sofa offers comfortable seating. 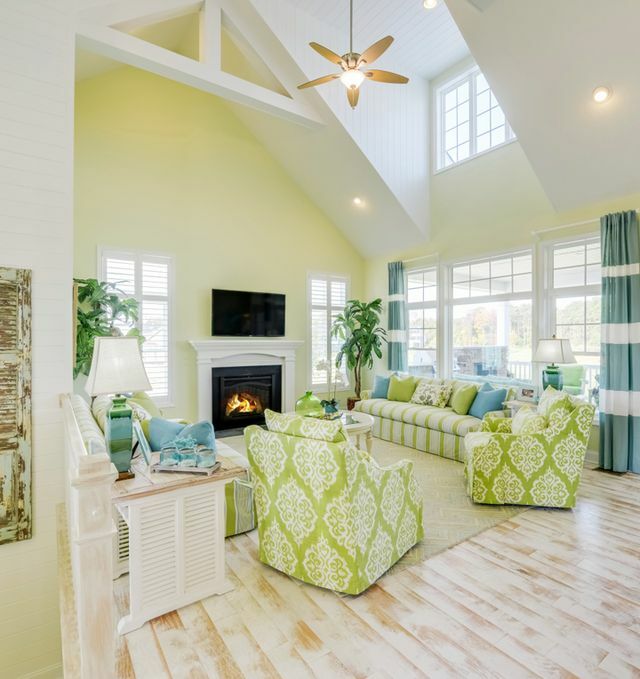 Apple green-painted built-in backs complemented by coordinated window treatment and throw pillows offer both a paint and no-paint way to incorporate green into any space. Elegant accessories add style and visual interest. In the picture above, a kids’ bathroom, which offers functionality and safety and works well with both girls and boys. This beach-inspired space with blue walls, green cabinets, and multicolored wall tiles is so adorable! Towels and décor details add touches of whimsy to the space. 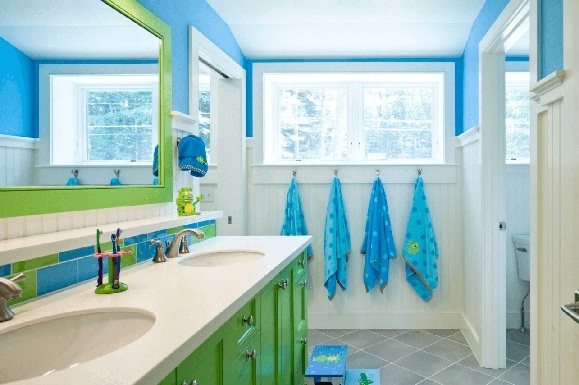 Definitely a vibrant bathroom, which every kid will love! Usually, wallpaper is an alternative to paint, which works well with walls and cabinet fronts and backs. Above shown, a living room with Monaco blue grasscloth wallpaper walls. An avocado green settee freshens the space. A spectacular armless sofa offers extra seating. Coordinated throw pillows add extra color and pattern. A pair of matching table lamps, a piece of wall art, and a unique coffee table bring visual interest and personality. If, for one reason or another, paint and wallpaper are not an option, then, turn to furnishings and accessories, they are the obvious solution for introducing color into any space. When carefully chosen and thoughtfully positioned, from large pieces of furniture, such as sofas, daybeds, cabinetry, and kitchen islands to smaller ones to furnishings to even tiny accessories, anything can do the job, the options are endless and it all depends on the function of the space and the needs and lifestyle of the homeowners. However, throw pillows and flowers offer a safe, easy, and budget-friendly way to experiment with any color. Always consider lighting fixtures and art pieces. Although usually underestimated as a solution to inject pops of color, as well as visual and sculptural interest, especially lighting fixtures are a key décor element in any space and can definitely be used as an extra way to add color. In the picture above, a bedroom with a unique bed. This space with a distinctive architectural character can make anyone feel happy. 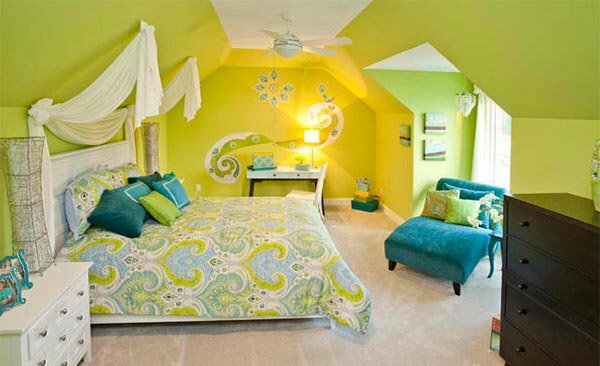 Lime green walls, one of which complemented by an eye-grabbing piece of wall art, a peacock blue accent chair complemented by a side table in the same color, bedding in blue and green… What a space! Plenty of throw pillows create a sense of coziness and add extra color and pattern. Mismatching chests of drawers offer adequate storage. Truly an impressive décor solution! On a side note, especially when used against the background of neutral walls, mixed patterns introduced by textiles/throw pillows, blankets, window treatment, upholstery, area rugs, and more/ are an easy yet creative and pleasing way to add color and visual interest. When working with three or more patterns, their colors shouldn’t be necessarily matched, coordinating the hues helps create spaces with a balanced, harmonious, attractive look. 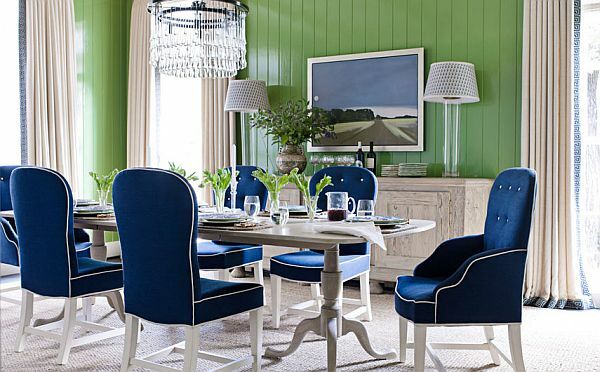 When it comes to creating interiors with a coastal vibe, blue and green are the most favorite colors to use. Above, a magnificent living room with a coastal feel. An imposing floor-to-ceiling fireplace creates a sense of warmth and coziness and definitely stands out against the background of the soft blue walls. A blue sofa and a pair of matching light green armchairs flanking the fireplace offer adequate seating. Throw pillows add pattern and texture. A bold Chevron area rug in blue and green ties the space together. Pieces of art and accessories add to the coastal vibe of the space. Potted flowers bring freshness and extra doses of color. 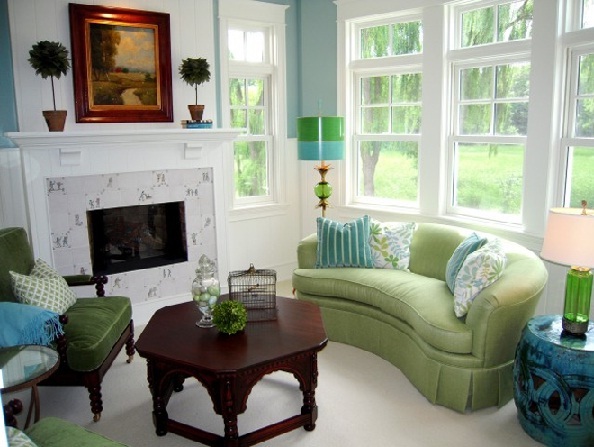 Above shown is an inviting living room in a blue-and-green color palette. A breathtaking ceiling, whitewashed flooring, adequate natural light, a fireplace, comfortable furniture, stylish details… Truly an intriguing space! Oversized potted flowers add extra color and freshness. 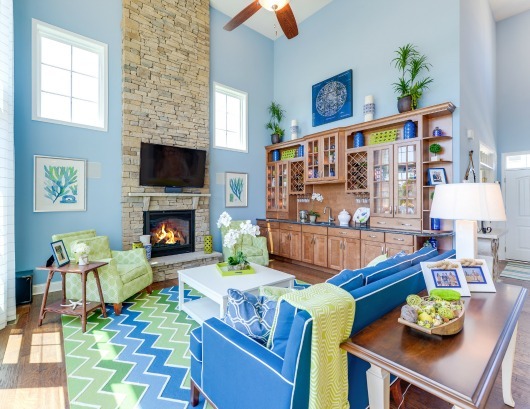 Blue and green definitely work well together in the above-shown living room. A sofa and a pair of matching armchairs offer comfortable seating. Stunning mismatching table lamps, a unique carved coffee table, and a ceramic garden stool repurposed as a side table add tons of personality. A painting positioned above the mantel adds artistic touches. Throw pillows are a way to bring extra color and pattern. This space is all about coziness, freshness, and a soothing ambiance! When incorporated creatively and thoughtfully, blue and green in their different shades, tints, and tones work well together and help create truly fascinating interiors. Usually used with white to balance the room and highlight unique architectural details, the blue-and-green color combo is a way to bring nature inside and add freshness and serenity to any space. So if you like blue and green you can go with combining them in a beautiful interior design.